The desolate city of Troy is in ruin and on the verge of destruction but the women of Troy are not giving up without a fight. In Ellen McLaughlin's adaptation of The Trojan Women, Euipides’ classic is updated through the modern lens of war and women's rights. This version of The Trojan Women is a heavy-handed drama that transports the action to a world unfamiliar yet strikingly known where a war-torn city is filled with refugees tattered from a battle over the woman that launched a thousand ships, as they say. The play revolves around the women of Troy, led by Hecuba, as they lament their loses and suffering as they become resolved to their unfortunate fate. McLaughlin injects a heightened realism in her text that honors the source material while still allowing her own stamp to be placed. But in a world where this story has seen an array of reinventions, what, if anything, did this new production offer? It's evident that if you dig deep enough, you can excavate parallels to recent events in the world and the hardships endured by the countless fallen innocent victims of war. There is evidence of a commentary of the rights of women and their bodies. What resulted in The Trojan Woman was a melodramatically one-note drama that fell a bit short. Director Anne Cecelia Haney’s direction was ambitiously uninspiring. 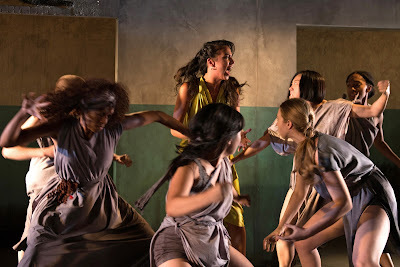 Whether it was concept or the company’s overall lack of connection to the material, The Trojan Women never quite found its footing. The piece seemed to be in a constant state of chaos and confusion. With an individual frenzied energy, the Chorus seemed to lack cohesion. It wasn’t until a new character entered the scene that focus was found. But when it came to focus, there was one who encapsulated it. Rebeca Rad was effortlessly radiant as Helen. She dominated the stage even when she was being overpowered. DeAnna Supplee may not have sold Hecuba completely but when she hit her stride, she dazzled. Scenically, Marte Johanne Ekhougen transformed the oft black walls of the space to an abandoned building in ruin. Even with a burst of color, the space evoked the despondency of the piece. Ekhougen also took on the role of costume designer. It was a strong choice to play with color and shape. It worked well to define status, both physical and emotional. Recently, The Flea’s offerings can be hit or miss. Unfortunately, The Trojan Women is the latter. The Bats tend to be game for anything but this one seemed out of their wheelhouse. This is a production that may rock you to sleep or completely empower you. But like the image you see when you enter the theater, you’ll wish you had a blanket.